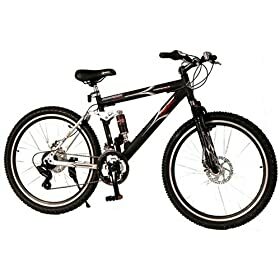 GMC Topkick Dual-Suspension Mountain Bike ; The GMC Topkick 21-Speed Mountain Bike features a full-suspension, strong aluminum frame that utilizes a floating beam suspension design that is mated to a Zoom suspension fork with elastomer/spring technology. The Topkick's drivetrain starts with Microshift push shifters. These shifters control Shimano's tried and true TZ-30GS derailleur. The drivetrain finishes up with a strong aluminum wheelset featuring V-shape rim profile and high-flange alloy hubs. Stopping is handled by Promax disk brakes on the front and rear. These brakes are vastly superior to rim brakes, especially under adverse road conditions.